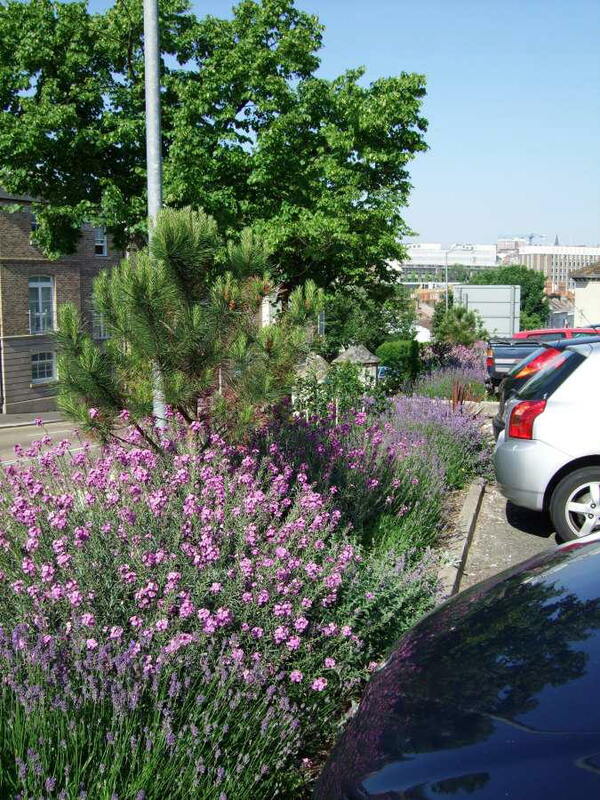 Brighton Business Centre - landscaping for Topcentre Ltd.
landscaping fitting for a flagship office building. Topcentre Limited, a leading provider of serviced office accommodation in the South East, was making its flagship office building in a prestigious, Victorian Gothic, listed building on an important hill-top location in Brighton. Topcentre engaged Lovely, Lovely, Lovely to design and build landscaping to enhance this beautiful building. The brief was to create an environment that would help to attract high-end clients to the facility, and which would require low maintenance. Unsurprisingly, there were several challenges that we had to overcome in the course of producing a coherent, attractive scheme that would thrive in the difficult environment. The site’s dramatic, exposed position means that it faces vicious, salt-laden sea winds that burn foliage. It also had thin, dry, chalky soil. These two factors meant that plants had to be expertly selected to ensure that they can tolerate such conditions. Furthermore, their care regime must take into account the stress that these plants are under. The open nature of the site meant considerable ingenuity needed to be applied unobtrusively to protect valuable plants and garden furniture from theft. The listed status of the building and its prominence meant that the local planning officers were also keenly interested in the project. The end result is a pleasing environment for visitors to and users of the building. For passers-by on the public highway, the scheme fittingly enhances the grandeur and beauty of the imposing building. Whilst it intentionally harks back to the style of our Victorian forebears, the planting is thoroughly modern in style. The species chosen are beautiful and apt; they are suitable for the harsh environment; they met with the approval of the planning officers; and they have modest maintenance requirements … and we shouldn’t neglect to note that achieving such balance is rarely easy! Purple and blue flowers harmonise with the flint. The palette of purples and blues beautifully accentuates the colours in the flint. The small shore pine keeps its shape throughout the seasons, and provides important structural character in winter.